After 10 years of vision we are pleased to finally announce our 2-Piece Rotor 4-Pot Front BBK that will fit most of the popular Lexus vehicles from the 90's through present day. 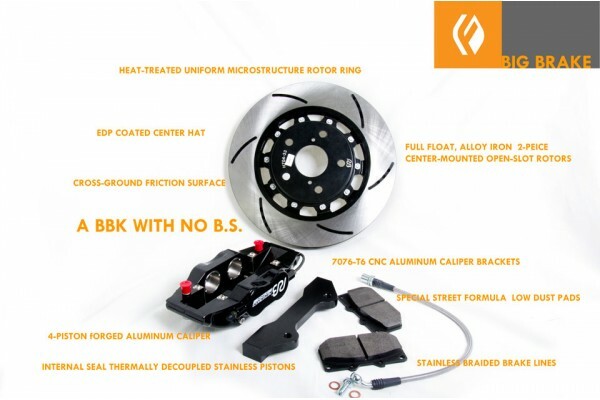 These kits utilize the latest patented technology from RB Performance Brakes to deliver a light, versatile and affordable braking upgrade while also keeping long-term replacement costs affordable. Rotors are a special alloy iron material that is heat-treated for uniform micro grain structure. This process and material are the key to the highest level of braking performance and wear characteristics. Aluminum center hats are EDP coated for protection. Patent Pending Open-Slot design combines slotted and vented rotor properties without the crack prone stresses involved with these 2 processes. Low profile design for more wheel fitment options. Uses Standard FMSI pads (D647) making replacement pad options vast. Tethered EPDM bleeder cap means no more lost bleeder caps. Made in the USA , Designed fully assembled and 100% hydro tested prior to shipment in Fullerton,CA. Canada shipments are tax exempt due to NAFTA guidelines. With all of these features these kits lead in performance and price.. Look at our other listings for complete package deals. *While these brake kits are created with the highest performance in mind, certain competition conditions and extended use at the track is not suggested. We have a heavier duty caliper design for extended track and competition use. Contact us for details. Preorder status. MKIII GS kits will ship the first week of Sept. IS kits will ship second week of Sept. Others to follow 2 weeks after..